I was recently impressed by a desert of chocolate brownie and rhubarb ice cream at Rufflets Hotel in St Andrews and had already talked idly about trying to replicate the fresh creamy ice cream myself. Then as luck would have it Vanesther over at Bangers & Mash www.bangermashchat.wordpress.com issued her May ‘Recipes for Life Challenge’ which called for entrants to get creative with rhubarb – a golden opportunity! So what is the Recipe For Life challenge all about? Each month Bangers & Mash issue three seasonal ingredients with which to create a (hopefully) fabulous dish. May’s ingredients are rhubarb, lemon and spice. The best recipes entered will be included in a new charity cookbook to be published by SWALLOW later this year. Swallow is a charity supporting adults with learning disabilities. 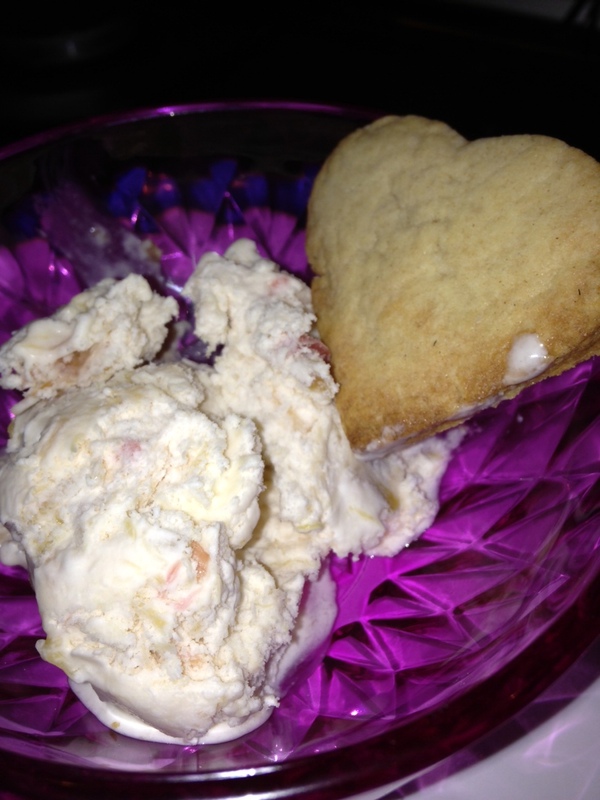 My challenge entry is Rhubarb Ice Cream with Lemon Spiced Biscuits. I am an ice cream making virgin and therefore I am not entirely sure how technically correct my method is but it was certainly simple and tasty. Prior to freezing this mixture tastes like a sumptuous version of rhubarb fool; it is actually a miracle that any of the mixture made it as ice cream as every 15 minute stirring trip to the freezer resulted in large spoonfuls finding their way into my gaping maw! The little biscuits are adapted from a Rachel Allen recipe. They complimented the ice cream perfectly. Place rhubarb in a baking dish. Sprinkle with sugar. Cover and bake at for 30-40 minutes or until tender, stirring occasionally. Cool slightly. Process in batches in a blender or food processor. Transfer to a bowl; cover and refrigerate until chilled. Stir in lemon juice. 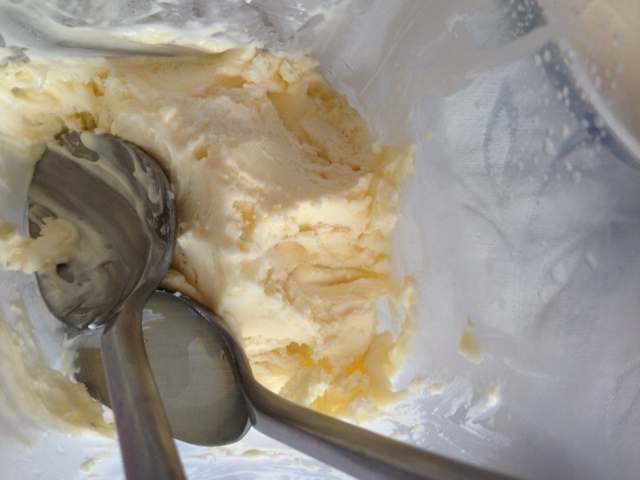 In a bowl, beat cream until stiff peaks form. 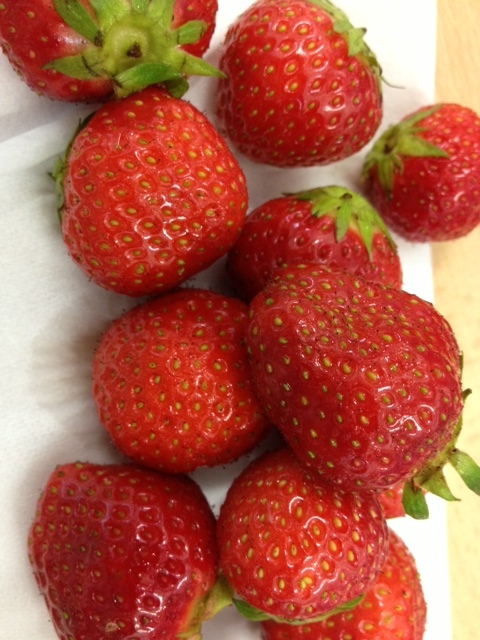 Gradually fold into rhubarb mixture. Transfer to a shallow freezer container. Freeze, uncovered, for 1 hour, stirring every 15 minutes. Cover and freeze overnight. Categories: CHALLENGES, RECIPES - BAKING, RECIPES - DESSERTS | Tags: chocolate brownie, creamy ice cream, fabulous dish, teaspoon lemon juice | Permalink. I am very pleased with myself as I have created my very own dish! Neither taken from a recipe book, nor tweaked from an existing recipe, but from my very own head. I have also made it sound rather sophisticated don’t you think? Plus I actually served it at a dinner party and they liked it. Ok they had consumed several bottles of wine by that point in the evening but I think their mutterings of pleasure were fairly genuine. As you know I have been trying to avoid eating my usual diet of cakes, pastries and chocolate. I have been doing extremely well but it was all threatening to go to hell in a hand cart if I didn’t come up with an after dinner alternative to sticky toffee pudding and clotted cream. I am keen to be healthy and slimmer but I am neither a martyr or a masochist. And so I decided that fruit was the way to go and started experimenting, I must say I was very pleased with the result. I fear that those of you who are blessed with the enviable ability to create brand new dishes willy nilly will not think much of this creation – it is very simple after all, but it is mine … all mine and I am just a teeny bit proud. Whip up your double cream and simply add the cinnamon and the honey – god is it really that easy! 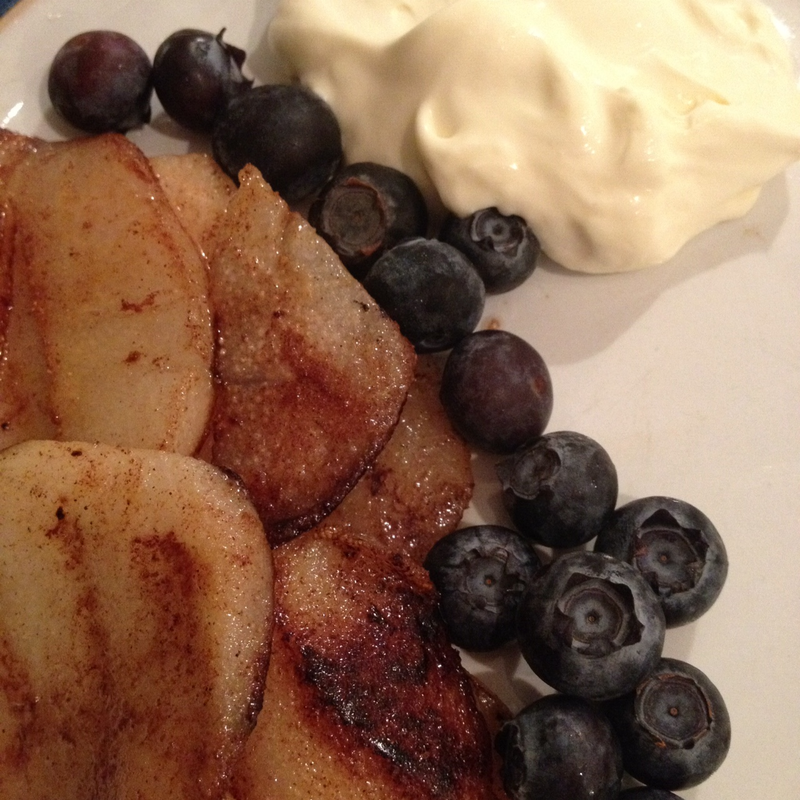 When it is nice and hot add the pear slices, cook until lovely and browned on both sides. Dust both sides with cinnamon whilst cooking. you might have to cook in batches so have your oven warmed to keep the first batch good and toasty until you serve. Hopefully your guests will purr with delight at having one of their five a day in such a pleasant way. Categories: RECIPES - DESSERTS | Permalink.